Seeing groups of cyclists around Traverse City sporting blue and orange jerseys has become commonplace. The name on the jersey? 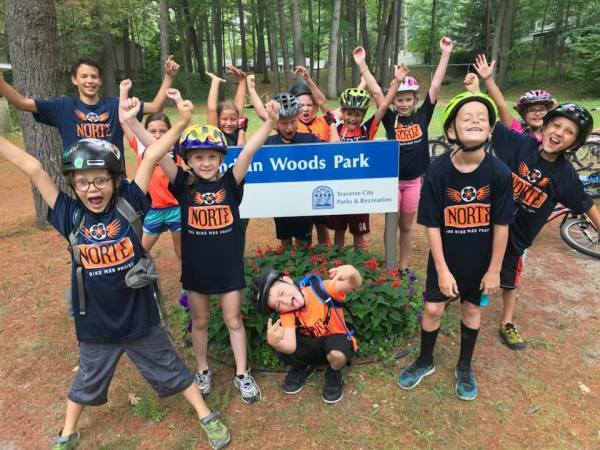 Norte, a non-profit group dedicated to making cycling part of the northern Michigan lifestyle from childhood on. Norte holds different events and classes around town to promote a bike-friendly and eco-friendly Traverse City. For seventh grader Colleen Madion, biking is a way to get out and get things of her mind. Norte co-founder Ty Schmidt said biking can improve many things in your life. Ty and his wife Johanna moved to Traverse City in 2006. When Ty biked with his son Carter to elementary school, he noticed the large number of parents dropping their kids off in cars. “I thought, ‘What’s up with this?” he said. “Why aren’t there more kids walking and biking? I started running a single bike train to school with family and friends.” His bike train to Eastern grew increasingly popular. In 2013, Ty and Johanna co-founded Norte. “It evolved from getting kids to and from schools, to educational programming, and this idea of community and better connections and walk bike friendliness,” Schmidt said. Norte now has the Clubhouse as well as the recently opened Wheelhouse, both at the Civic Center. Both are places where young people can learn about bikes and how to fix them as well as meet and socialize with other riders. Ty said the Wheelhouse has expanded Norte’s future. Norte has different bike groups such as Estrellas, and the Mountain Bike teams. I’m part of the Mountain Bike team and I’ve found it makes me work harder and take more risks. I’ve also made a really great group of friends away from school. Madion is also on the Mountain Bike team and is involved in other Norte activities. She likes working the bike valet service where people can safely leave their bikes for free. Eighth grader Will Unger is also involved with multiple Norte activities. Unger’s passion is mountain bike racing. Although Norte started as a bike-focused group, they have expanded to stress the importance of walking as well. Madion thinks Norte provides a positive impact on Traverse City. “You know, it’s more exercise for people who don’t get a lot of exercise and it’s gotten more people involved in biking,” she said. Unger thinks the education aspect of Norte is important too. “It’s given people a way to learn how to go places on bikes,” he said. Ty believes the benefits of biking are many. “Bikes are more than sport,” he said. “They’re more than recreation. “They’re more than toys…especially when we’re young people and we don’t drive.